Monte Grappa needs no presentations: as a crucial and strategic point during the whole conflict, it hosts on its summit one of the most representative monuments of WWI in Italy. It has however much more to offer, such as the innumerable itineraries in its surrounding, that run through old military roads and trenches and allow to discover and admire many concealed “botanic garden” amidst the war ruins. Moreover, you can find the right itinerary in every season of the year, even in winter (obviously, only if you have the required training and a good experience to manage with the – sometimes sudden – weather changes). The first suggestion concerns Monte Meatte and the newly restored trenches of Monte Boccaor. The hike is not so overwhelming, it only requires an appropriate mountain equipment. The whole tour lasts about 5 hours (take something to eat with you, for a short break on the summit, in the case) and it is fascinating especially in autumn. From Paderno del Grappa, locality Fietta, drive up to the Valle San Liberale, till the end of the road, where you can easily park. Before start walking, you may have a look to the informative labels which describes the trenches and the military buildings still partially present in the San Liberale Valley, which was in fact the starting points of many paths used to bring supplies to the troops at the front line. Take then the path n. 153, to hike up to Meatte Mountain. 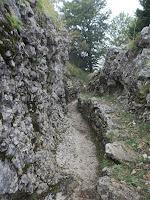 It is a large military road, which preserves in the first section the original stony pavement, turns then into a smaller path. Everywhere you can discover caves, used as shelters and bivouacs. During the ascent in the wood, pay attention to the signals and the labels, since there are some interconnections with other paths, such as the n. 151 (that will be the one of descent) and the Via Ferrata Sass Brusal, a short, yet wonderful climbing, which has to be undertaken only by very experienced hikers. The path n. 153 on the contrary leads easily out of the wood, runs in its final section through small galleries (torch is in this case not required) and small saddlebackes, and reaches the path n. 152 on the crest. From this intersection, if you take on the right, you can easily reach Cima della Mandria and Malga Archeson. 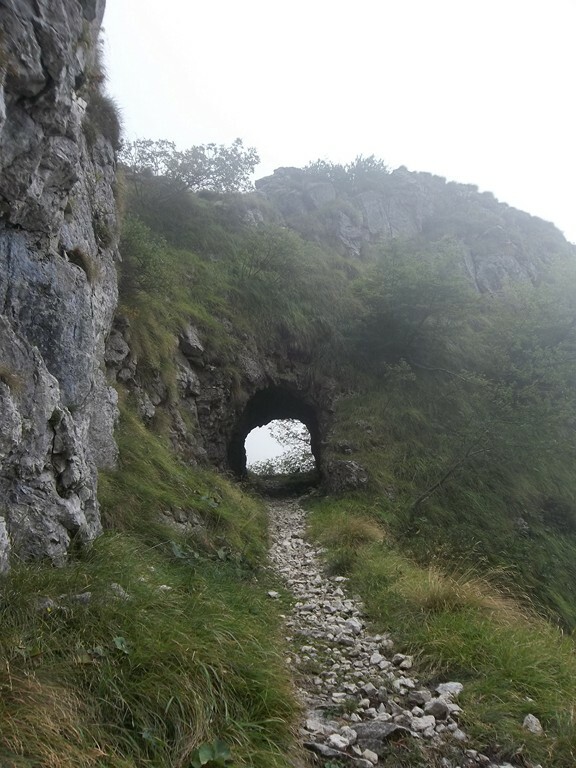 But we suggest you to take on the left, following the path n. 152, to the “Meatte Path”, a road made by the military Engineer Corps in 1918 on the southern slopes of mount in order to assure supplies to the troops and enable their movement. 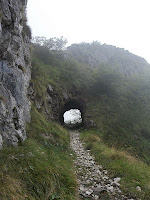 You can follows this panoramic road between the rocks, with a spectacular view on Valle San Liberale and – if the day is bright – on the venetian plateau. We propose, however, a small variation to the common tour, in order to visit the newly restored trenches of the Monte Boccaor, beside Monte Meatte. On the path n. 152, as you reach three small fountains on the right (no potable water available), few meters ahead, again on the right, starts a small tracks. If you walk few steps along it, you can immediately recognize on the left, climbing the crest, the starting point of the trenches. We highly recommend this particular itinerary (even if it means, you won't walk the whole “Meatte path”, except in the case you have some extra time to visit both) because you'll have so the chance to walk inside the trenches, feel the tiny space between the stones where the soldiers spent their nights and days, visit the shelters , try to lie in the fire position or have a look to the pool used to collect rainwater. In short, we highly recommends this track because it enables you to understand bodily what spending time in a trench meant. In autumn, the fog may increase the feeling, so as in winter the snow and the frozen temperature do. You can walk the entire trenches line till Val delle Mure, a docile, green, glacial valley. Val delle Mure became from 1917 a sort of “no mans land”: the Italian troops fighting on the summit had to pass through this valley, under the fire of Austrians-Hungarians, in order to transport supplies and wounded down to San Liberale. From here, do not walk on the provincial road, take instead short on the left, walk through the meadows and reach again path n.152, which it's easy to recognize on the crest, with its stony pavement. Follow for some meters the path n. 152 again, till you reach the intersection with path n. 151, a easy track which leads down back to San Liberale. If you want to rest and eat something, two restaurants are placed beside the parking.